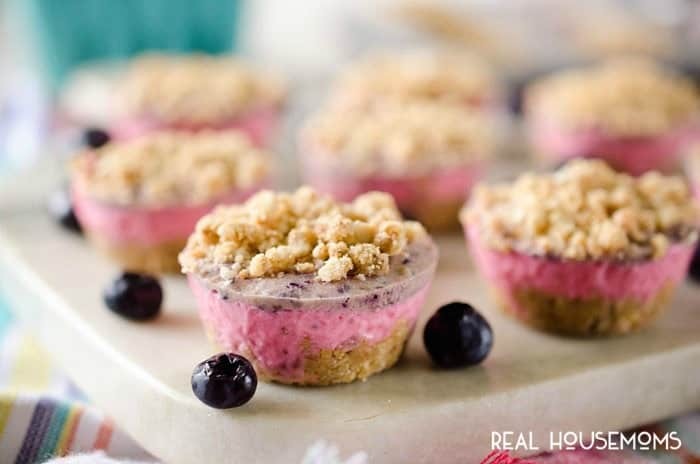 FROZEN BERRY CRUMBLE BITES are delicious bite-sized treat full of fresh berries mixed with creamy Cool Whip and topped with a crunchy pecan crumble! This weekend was a true whirlwind! I thought it was going to be my first quiet weekend in over a month with no photo sessions booked or family plans made. That is until Saturday morning, when I get the call from my little sister that she is currently at the clinic in labor! EEK! I immediately rush through my yard work I needed to get done because my lawn was starting to look a little wild. After wrapping up the work around the house, I set to work making some meals to stock her freezer with. Million Dollar Spaghetti, Fiesta Chicken and Rice, a Cajun Shrimp Quinoa Bake and some Cranberry Almond Energy Bites were all packed up ready to be frozen. I also made a batch of Pineapple Chicken Salad for her to enjoy as soon as she got to the hospital. She already has all of the baby supplies, adorable outfits and necessities, so I figured I would gift her the one thing we both love. Food! 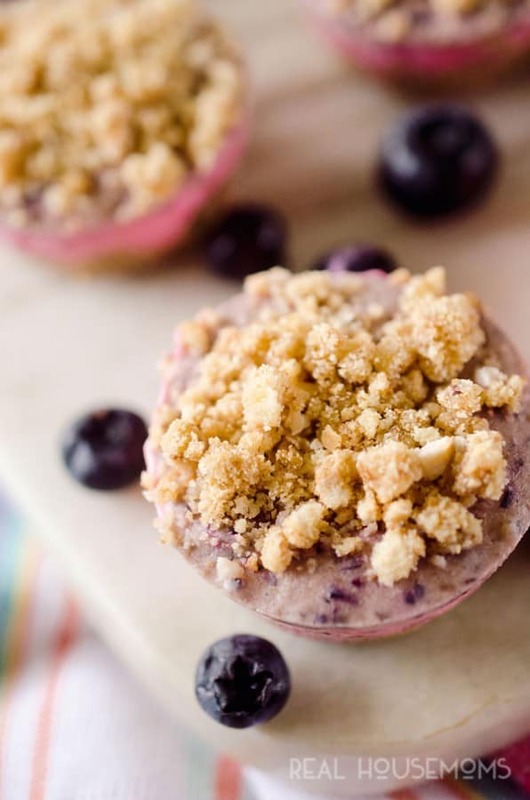 Whether you have little ones or just enjoy a flavorful bite sized treat, these Frozen Berry Crumble bites are the perfect way to kick off the warmer weather! 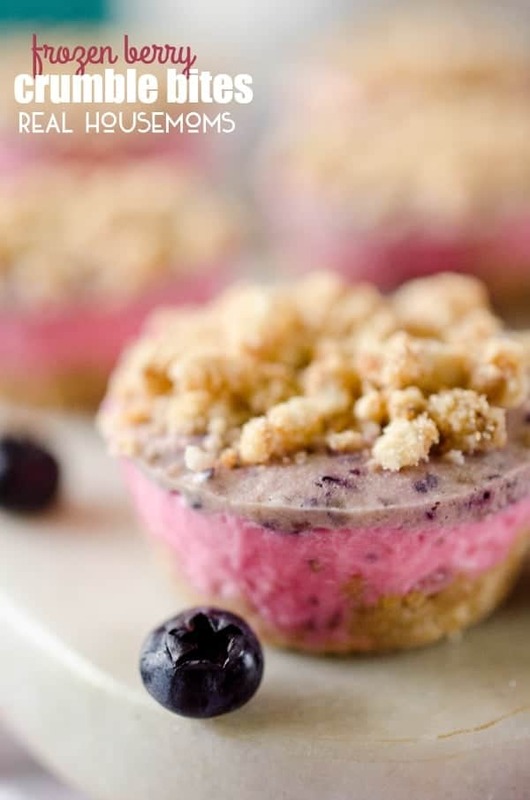 Frozen Berry Crumble Bites are delicious bite sized treat full of fresh berries mixed with creamy Cool Whip and topped with a crunchy pecan crumble! Add the pecans to the other half of the mixture and set aside. Meanwhile, in a food processor, add the cream cheese, pudding mix and sweetened condensed milk. Puree for 2-3 minutes, until smooth and thickened. Remove half the mixture from the food processor and add the strawberries. Puree until all of the strawberries are smooth and incorporated. 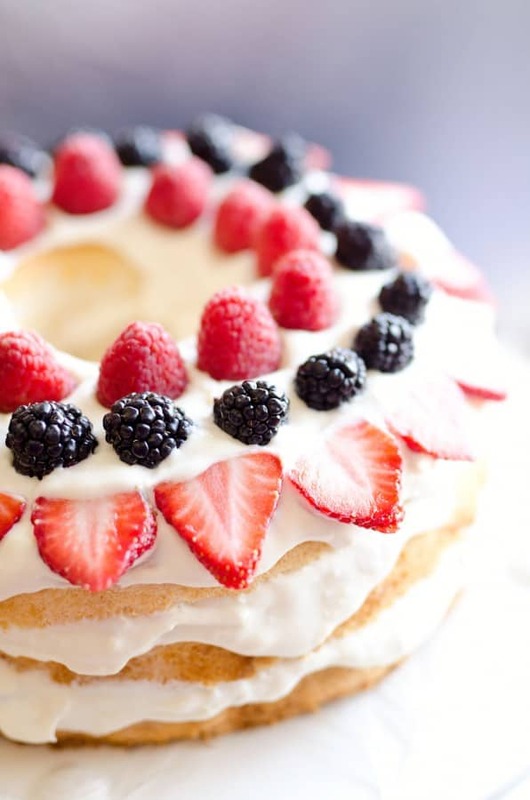 Scrape the strawberry mixture into a bowl and gently fold 1 c. Cool Whip into the strawberry mixture. Set aside. Add the remaining cream cheese mixture along with the blueberries to the food processor and puree until smooth. Remove from the food processor and fold 1 c. Cool whip gently into the mixture. Add 2 tsp. of the strawberry mixture to each muffin tin and shake the pans well so it settles evenly. 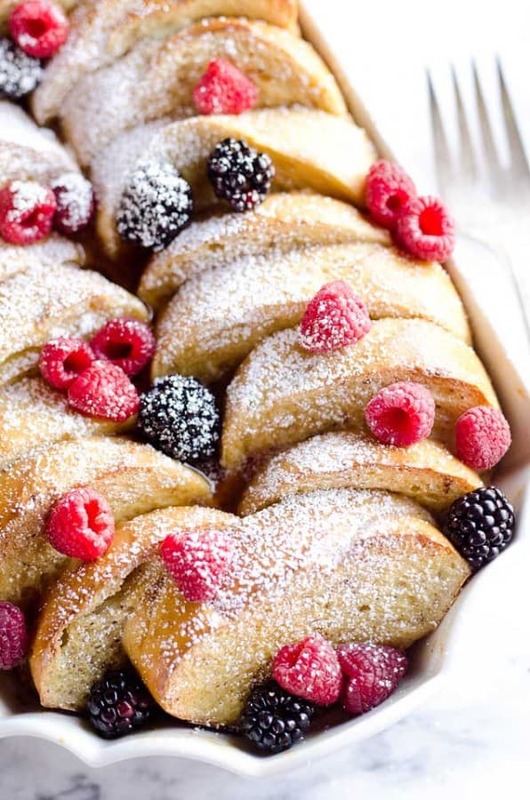 Top each bite with 2 tsp. blueberry mixture and shake again. Finish them off with sprinkling the pecan mixture over the top. Freeze for at least 3 hours. Store frozen for up to 2 months. Serve cold.